The Franziskanerkirche or Franciscan Church of Vienna is an unusual Renaissance building that was later upgraded to Baroque and can be found in the Medieval core of the first district, not far form the old university area. It is in a somewhat hidden corner with not too many tourists making their way there, which adds a lot to the appeal of the area: There is a small, Italianesque square in front of the church and several cafes, restaurants and antiques stores. The church itself is dedicated to Saint Hieronymus, who is depicted above the church's main entrance. He faces a fountain that is decorated with a statue of Moses. The church was built in 1603 on a site that had previously been occupied by the church of a nunnery. This older church had also been dedicated to St. Hieronymus. 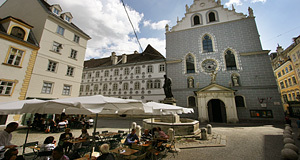 The Franciscans′ previous church in today′s district of Mariahilf had been destroyed by the Turks in 1529. The style of the building is predominantly in the late Southern-German Renaissance, notable in the façade, the pointy windows and the ornaments. The gate that I have mentioned above, the one with St. Hieronymus, was added later, in 1742, and is Baroque - therefore, it doesn′t really match with the rest of the building. The interiors are Baroque, too. The altar was made by the Italian artist Andrea Pozzo. The organ of the Franciscan church, the Wöckherlorgel was made in 1642 and is considered the oldest in Vienna. Another attraction are relics of St. Anton. Most of the interior ornaments were made before 1720. An important exception is the tomb for Pater Petrus Pavlicek, a Franciscan from Vienna. He started a rosary movement that is now an international organisation. He died in 1982, but his movement is quite active with several hundred thousand members. Petrus Pavlicek is in the process of being beatified. His tomb was renewed in 2001 and is now a modern feature in the Baroque setting. It is worth looking up his biography, Petrus Pavlicek was a very inspiring person with a pretty moved life. Another interesting feature of the Franciscan church is the tomb underneath the church. The monastic "family" of Minorities, Capuchins and Franciscans used to be popular receivers of dead bodies - noble families and wealthy people stored their dead relatives in the basements of the monks. This applies to the tomb of the Michaelerkirche as well as to the Capuchins′ church (the "Imperial Tomb" of the Habsburg family) - and the Franciscan church. But only the latter one is strictly not open to the public and therefore, not very well-known. There are approximately 1,000 people buried in the tomb. Many of them were noble. When the Napoleonic troops invaded and plundered Vienna, the French soldiers opened the tomb and destroyed many of the coffins in the quest for jewellery. Many of the corpses, by the way, are mummified. After the French withdrew, the tomb was closed again and not opened for more than a century. Only a few years before WWII, the monks opened it again and found the mess that the French had left. One monk decided to tidy up (meaning: pick up the bits and pieces of mummified corpses and put them back together), but he died, probably from a fungal infection. As a result, the tomb was closed again and properly renovated only in 1970. Nearby attractions include the Mozarthaus, the House of Music and the Museum of Applied Arts in one direction or the Stephansdrom in the other.